Derek Jarman was famous for making films such as Jubilee and Carvaggio when I was a girl. Dungeness was notable for its nuclear power stations, small gauge railway and its crabs. 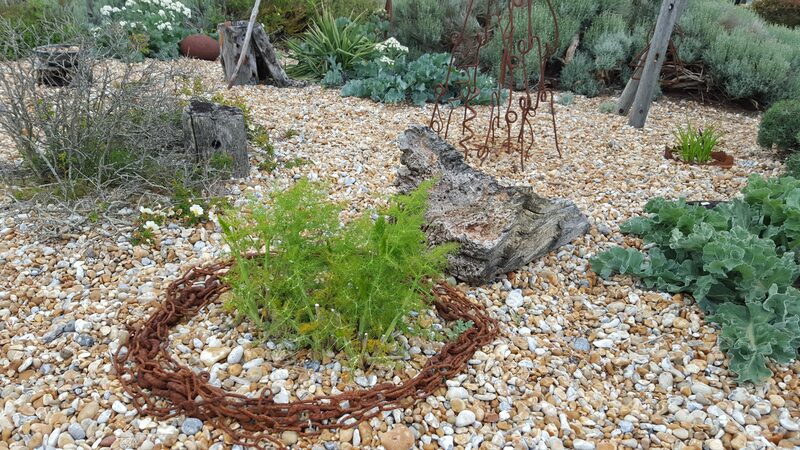 Now more than twenty years after his death Jarman has become a renowned gardener and Dungeness still has the attractions of my youth. But say that’s where you’re going and most people will ask if you are headed to Jarman’s garden. Dungeness has 2,000 hectares of shingle, making it the largest area of vegetated shingle in Europe. Millions of flint pebbles have gathered on the headland, arranging themselves into ridges with little pebbles at the bottom. It is in dips of the ridges that a few hardy species grow, giving the area a stripy appearance. 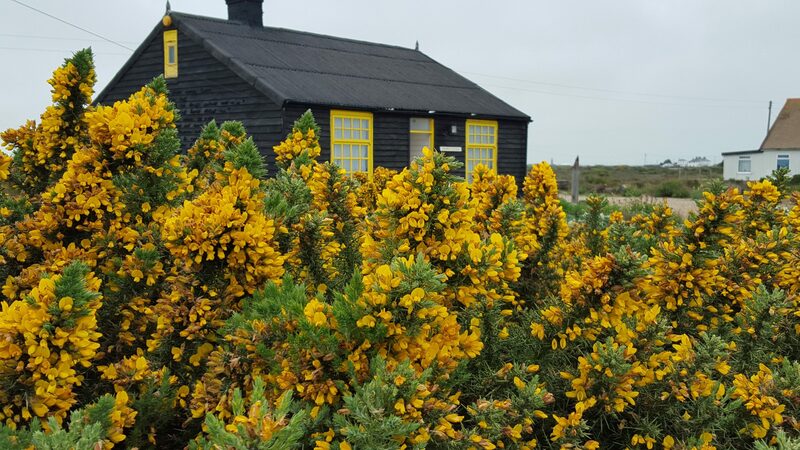 Derek Jarman noted that some plants thrived naturally and encouraged some of those wild plants to grow around Prospect Cottage. He also introduced unusual garden ornamentation in the form of flotsam and jetsam that he found on the beaches. Every gardener itches to try and get new things to grow in their garden and Derek Jarman was no exception. He discovered that California Poppies, Sempervivum, Lavender and Cistus all thrived on the poor stony salt lashed soil. The garden is unusual in that it has no boundaries, slowly the natural scatter of gorse bushes and sea kale gives way to a denser more ornamented planting. Prospect Cottage remains private and the garden is not formally open to the public. However there are no boundaries and visitors wander around the plantings as they do the rest of gravel expanse. Fish is the thing to eat when at Dungeness. 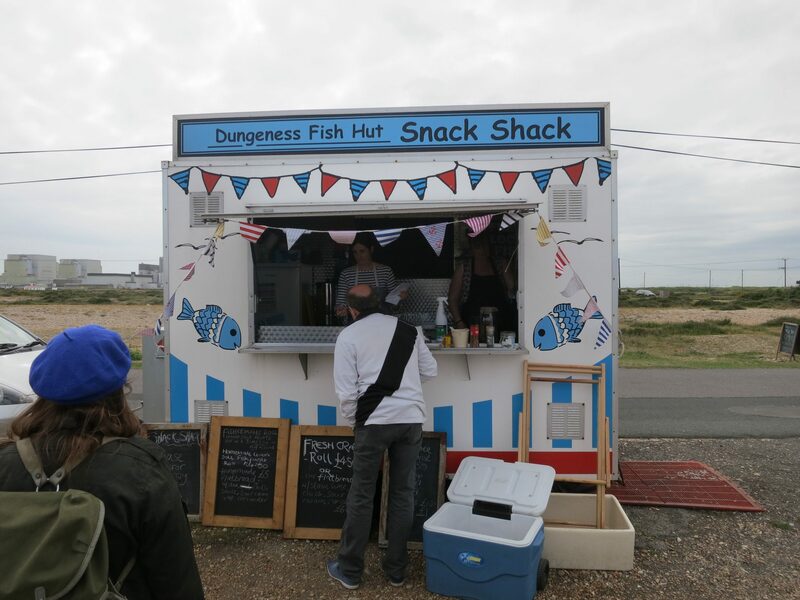 We selected the Dungeness Fish Hut Snack Shack. It is a trailer selling baps and wraps filled with fish and crabs caught by their own boat. I had a crab wrap with thai dressing washed down with a cup of tea and it was excellent, Mr CW a lemon sole fishfinger bap which was eaten with quiet relish. If you prefer to sit inside, the Pilot Inn does a roaring trade in fish and chips but gets very busy so it might be an idea to book ahead. I want a huge lawn with tons of plants and flowers and trees! Awww…that’s just heaven. There was an amazing Cistus that makes me want one! 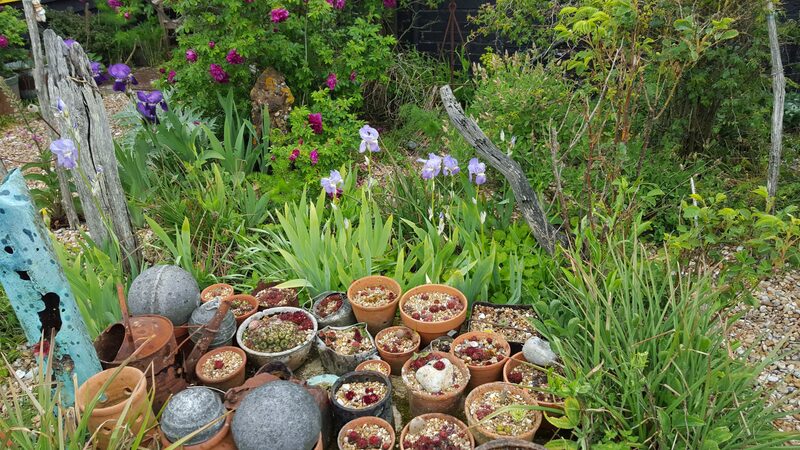 Who would have thought Derek Jarman was a keen gardener. I want to visit!